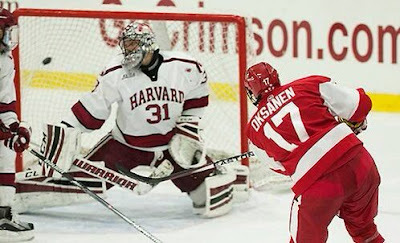 As has been rumored for several months, former Terrier sniper Ahti Oksanen has signed a contract with the Rangers’ AHL affiliate, the Hartford Wolfpack. The Kirkkonummi, Finland, native, who played the second half of last season with a torn labrum, scored 115 points (51G, 64A) as a Terrier. After two seasons as a blueliner, he moved up to wing and became one of BU’s top offensive players. ESPN’s Corey Pronman’s list of the NHL’s top 120 prospects includes four Terriers: Clayton Keller (#6), Dante Fabbro (#21, photo), Kieffer Bellows (#33) and Charlie McAvoy (#45). All four were first-round picks in last June's NHL entry draft. One current Terrier and two members of the 2017 recruit class have been selected to play in the 2016 CCM All-American Prospect Game, set for Sept. 22 in Philadelphia. 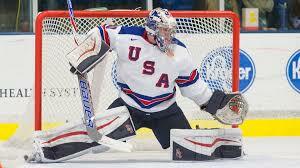 Freshman goalie Jake Oettinger from Lakeville, Minn.,will be joined by NTDP U18 skaters David Farrance, a left-shot defenseman from Victor, New York, and Logan Cockerill, a left-shot forward from Brighton, Michigan. The 2016-17 NTDP U17s have reported to Plymouth, Michigan to prepare for their season, which begins on Sept. 9. This season's U17s roster features four future BU forwards: Jack DeBoer, Joel Farabee, Tyler Weiss, and Jake Wise. 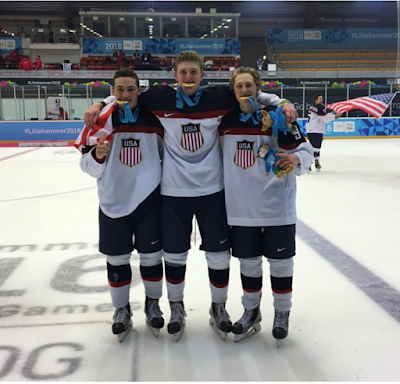 DeBoer, Weiss and Wise (photo) were gold-medal teammates at last winter's Youth Olympic Games in Norway. ● Wise snipes a top-shelf goal at Shoot To Score. Former Terrier netminder Jason Tapp has been promoted to Associate Head Coach at Union College. Tapp initially joined the Dutchmen staff in 2009-10 as a volunteer assistant goalie coach and became an assistant coach when Rick Bennett assumed the head coaching duties in 2011. Oettinger is one of four NTDP U18 alums in the 2016 recruit class, joining Clayton Keller, Chad Krys and Kieffer Bellows. 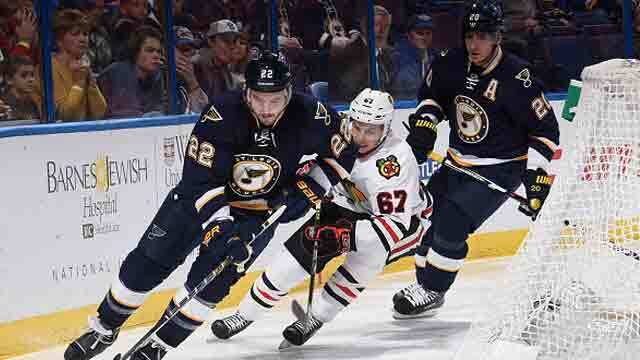 Former Terrier captain and All-American Kevin Shattenkirk has been named a co-captain of the St. Louis Blues. The New Rochelle, N.Y., native, who was a standout on BU’s 2009 national champions, joined the Blues midway through the 2010-11 season and has scored 242 points in 410 regular-season games. Shattenkirk, who becomes an unrestricted free agent at the end of this season, had been the subject of numerous trade rumors. 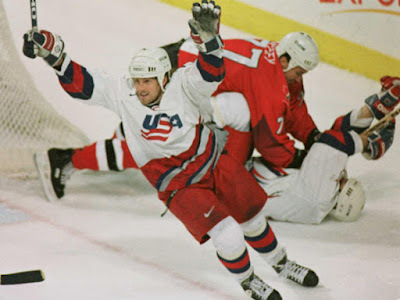 USA Hockey Magazine spoke with former BU and NHL standout Tony Amonte for a report on how members of the victorious US 1996 World Cup of Hockey squad have inspired the current generation of Team USA players. The 2016 World Cup of Hockey begins on Sept. 17 in Toronto. 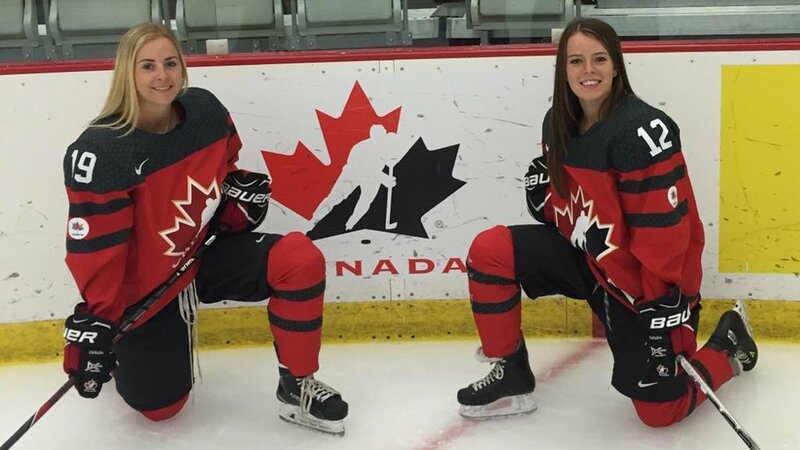 Four former Terriers were selected in the 2016 CWHL Draft. Last season’s captain Kayla Tutino was the first overall pick, going to the Boston Blades. Sarah Lefort was selected three picks later by Les Canadiennes. The Blades would draft two more Terriers: Dakota Woodworth in the fifth round and Alexis Woloschuk in the seventh. Brandon Fortunato has left the BU hockey program and will transfer to Quinnipiac. The North Hills, N.Y., native who scored 40 points (6G, 34A) in 79 games for BU, will sit out the 2016-17 season before completing his remaining two seasons of eligibility. With Fortunato’s departure, BU has eight blueliners led by senior Captain Doyle Somerby. Also returning are juniors Brien Diffley, Brandon Hickey and John MacLeod, and sophomore Charlie McAvoy. Highly-touted freshmen Dante Fabbro and Chad Krys complete the blueline corps. 2018 recruit Tyler Weiss, a North Carolina native, talked with the York (Penn.) 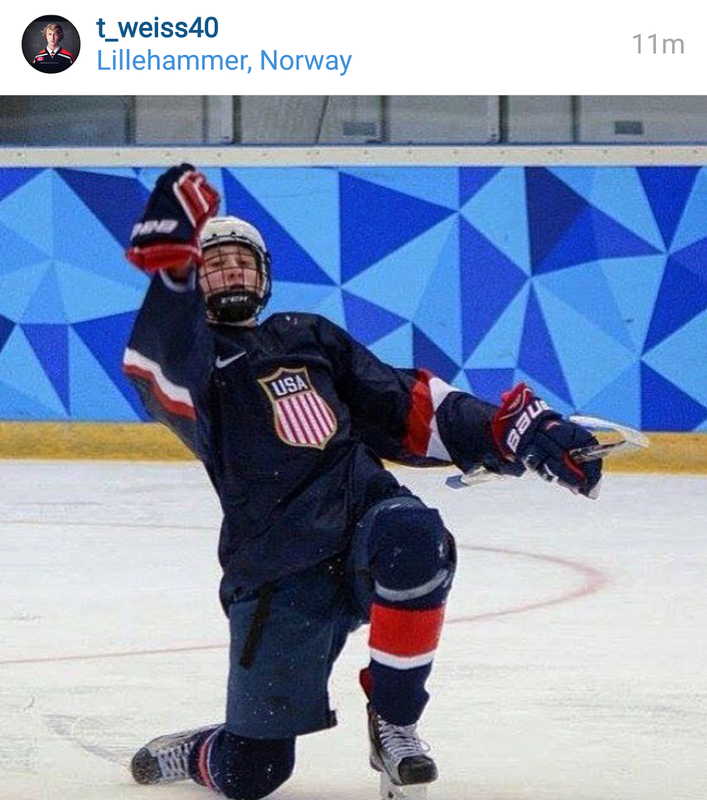 Daily Record about his decisions to play for the NTDP U17s next season and then skate for the Terriers. He scored 63 points (28G, 35A) in 52 games for the Don Mills Flyers Minor Midget AAA squad last season. He also skated for Team USA in the 2016 Youth Olympics, helping future Terrier and NTDP teammates Jake Wise and Jake DeBoer win the gold medal with four goals and five assists. Former BU All-American and captain of the 2002-03 Terriers Freddy Meyer talks about his collegiate and pro career as well as his coaching career. He’s currently head coach of a Boston area junior team, the East Coast Wizards, and runs hockey camps and clinics. BU junior forwards Victoria Bach and Rebecca Leslie are skating for Team Canada’s U22 National Team in its three-game series against Team USA in Calgary. 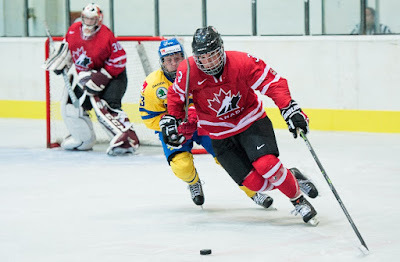 Canada won last night’s opening game, 2-1, with Bach tallying the game’s first goal and assisting on the game-winner. Team USA’s Under 22 Select Team is being coached by former Terrier netminder—and current Providence College head coach—Bob Deraney. Terrier assistant coach Katie Lachappelle is an assistant coach for Team USA’s 2016 Women’s U18 Select Team that is playing a three-game series vs. Canada in Calgary beginning Aug. 18. Coaches and captains of eight Hockey East schools were at Fenway Park prior to yesterday’s Sox-Yankees game to promote next Winter’s Frozen Fenway doubleheaders. 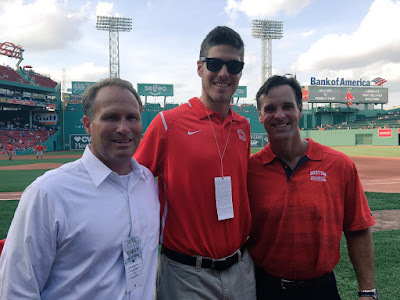 BU was represented by Head Coach David Quinn and senior captain Doyle Somerby, along with Athletic Director Drew Marrochello. Terriers will play UMass at 1:30 p.m. on Saturday, Jan. 7, with BC and Providence playing in the nightcap at 5 p.m. A week later, the doubleheader will have Maine vs. UConn and New Hampshire taking on Northeastern. 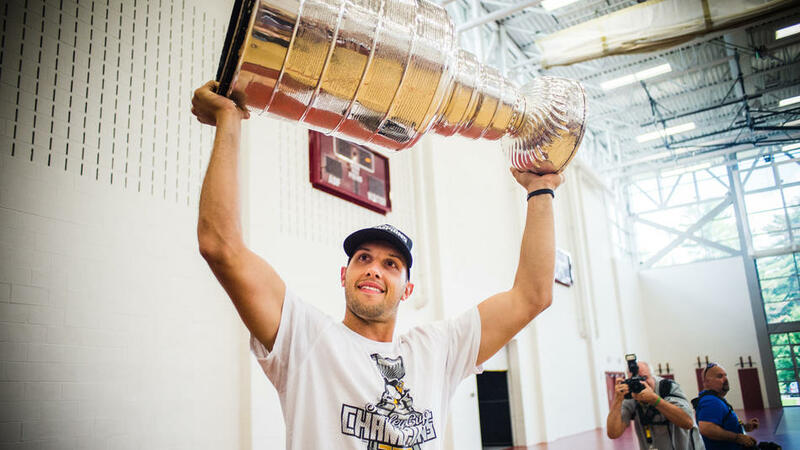 Thursday was Nick Bonino’s day with the Stanley Cup and he brought the hallowed hardware to Avon Old Farms, where he won a New England Prep School title in 2007, prior to helping BU win the NCAA title in 2009 and centering the Penguins’ HBK Line in their run to the NHL championship. A large crowd showed up to pose for photos with Bonino and the Stanley Cup. The Farmington, Conn., native turned the event into a fund-raiser for Connecticut Children's Medical Center with contributions totaling more than $5,000. In addition, Uber made a $4,000 contribution.